Here you will find plenty of veggie-packed gluten free main course ideas. From quick midweek meals, to special showstopper dishes give one of my gluten free vegetarian main course recipes a try. Aubergine Parmigiana – an Italian special of aubergine layered in a rich tomato sauce and topped with cheese. Slow-baked, this is fantastic with gluten free garlic bread and a leafy salad. 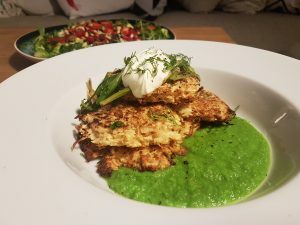 Celeriac Rosti with Pea Puree and Crispy Spring Onions – stunning colours but a simple recipe. Not sure what to do with celeriac? Well give these gluten free rostis a try! Curried Carrot, Sweet Potato and Red Lentil Soup – a wonderful, warming soup that also happens to be dairy free and vegan. 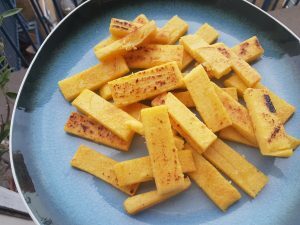 Gnocchi – homemade gluten free gnocchi that are light and fluffy. Halloumi and Aubergine Burgers – who needs meat when veggie burgers can taste so good?! Leek, Spinach and Ricotta Puff Pastry Tart – I use ready-roll gluten free puff pastry for this fail safe recipe. It is a wonderful midweek meal, topped with crunchy pinenuts. Polenta with Mushrooms, Kale, Roasted Cherry Tomatoes and Parmesan – buttery, soft polenta topped with all sort of veggie goodies. Naturally gluten free and a real bowlful of comfort food. 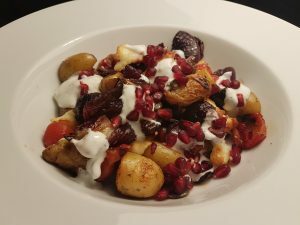 Pomegranate, Halloumi and Roasted Vegetable Tray Bake – roasted potatoes and veggies topped with salty halloumi and sweet pops of pomegranate. A minted, garlic yoghurt dressing brings the elements together perfectly. Puff Pastry Spring Tart – another easy use of gluten free puff pastry. This spring tart is fantastic any time of year and is a perfect gluten free showstopper lunch. I could eat this all day long! 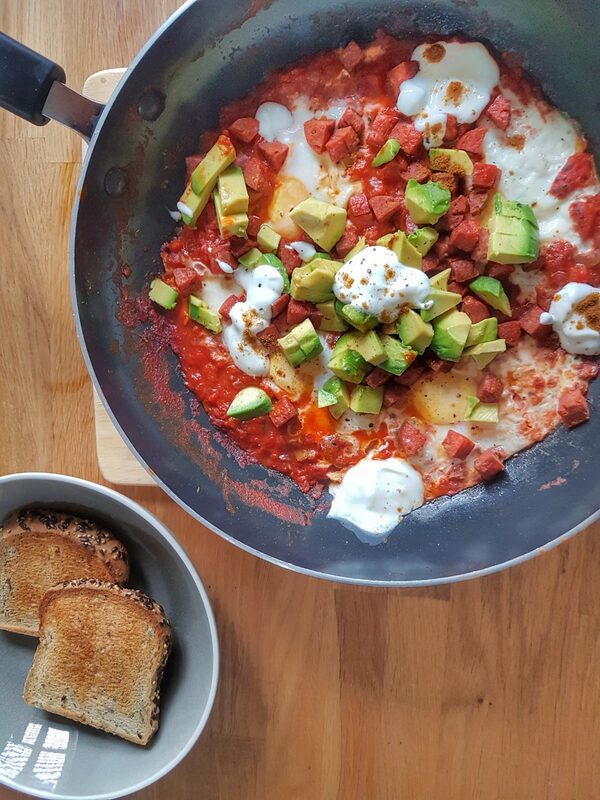 Shakshuka Baked Eggs – a classic North Africa brunch dish of eggs baked in a slightly spicy tomato sauce. Top this with chorizo or avocado and yoghurt for a spectacular sharing dish. Vegetarian Chili – sweet potaot and black bean chili with aaaaall the toppings. Watercress Soup with Gluten Free Flatbread – fresh, peppery watercress soup paired with gluten free olive and sundried tomato flatbreads. Dreamy.